"Business Still Hopping at Red Rabbit: So many years, so many Bunny Burgers." When did you take a bite of your first Bunny Burger? Since 1964, millions of midstaters have regarded their first trip to the Red Rabbit Drive-In as almost a rite of passage, a tradition that continues as the old-school eatery celebrates its 50th anniversary this year. 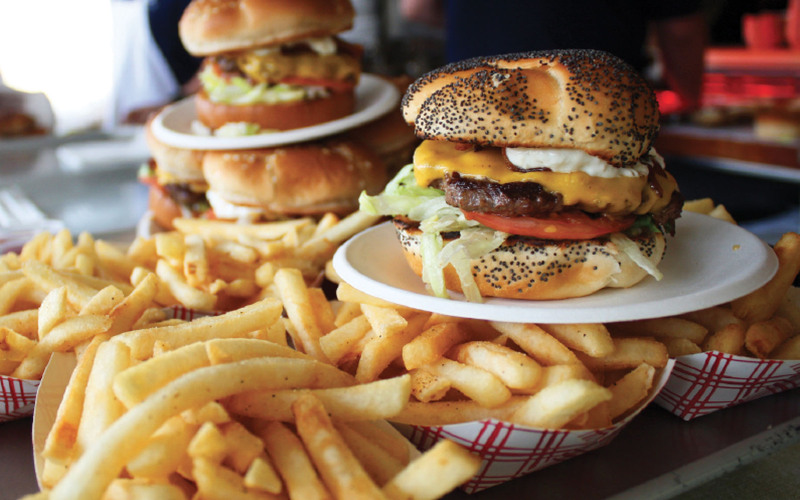 The 1950s retro vibe is reminiscent of the popular “Happy Days” television show, with orders delivered curbside. Pull up, park and give your order; it’s that convenient. A waiter or waitress will return with a tray, and you’ll be on your way to enjoying a meal with the family within the cozy confines of your vehicle. Nearby picnic tables are nestled beneath a roof for those who prefer more elbow room and the opportunity to dine al fresco. On the menu is an array of standard, uncomplicated family fare from hamburgers to cheeseburgers, fish sandwiches, ham and pork barbecue and, of course, fries. Dinners include chicken, shrimp and fish, to name a few, and the homemade coleslaw is always a hit. Hungry guests can warm up with a bowl of chili during the colder months, and little ones especially enjoy the chicken fingers, grilled cheese, hot dogs, ice cream, shakes and slush puppies. Because the Red Rabbit closes for 10 weeks each year after Thanksgiving, many customers anxiously await its re-opening in February as a harbinger of spring, when families can shake off those winter doldrums and hit the open road for a bite of something tasty. First-timers take note and plan accordingly: The Red Rabbit only serves customers from Friday through Sunday. Manager Sam Berger’s grandparents, Sam and Maggie Snyder, started the little roadside restaurant on a plot of land about 15 miles upriver from Harrisburg, where Distlefink’s Ice Cream and Sandwich Shop was previously located. It turned out the decision to buy the property was a wise one, and the business with the catchy phrase and cute logo took off. Berger’s parents, Sam and Cindy, took over the business in 1988, and, today, they employ 30 staffers. Sam helps manage the business that has remained fairly steady throughout the years. One of the few things that has changed is online traffic. Thanks to social media, the Red Rabbit is now mentioned on Yelp, Foursquare and TripAdvisor, and the Facebook page is gaining in popularity. As for traditional traffic, Berger said that’s been fairly constant and is almost evenly split between locals and those just passing through. “We do get a lot of business from Penn State fans during football season,” said Berger. Lancaster resident Christina Schoffstall is one of those Penn State fans who makes it a point to stop when passing through. Cindy Moyer of Northumberland has been a fan for years. For those unfamiliar with Bunny Burgers, take heart—they have nothing to do with the cute furry animals that hop. The popular menu item consists of a ground beef burger, hickory smoked bacon, melted cheese, shredded lettuce, tomato slices, pickles, onions and a special sauce on a seeded roll. Moyer lost her parents in the ‘90s, so the pilgrimage fills her with nostalgia. Berger said hearing such stories warms the hearts of the family that works so hard at what they do. The Red Rabbit is located at 60 Benvenue Rd. (Route 322), Duncannon, a half-mile west of the Clarks Ferry Bridge. For hours of operation and more, visit www.redrabbitdrivein.com. Copyright © 2014 The BURG. All rights reserved.